Grain Free Dog Food From Taste of Nature pet foods with 50% meat is a natural balanced diet for your dog. 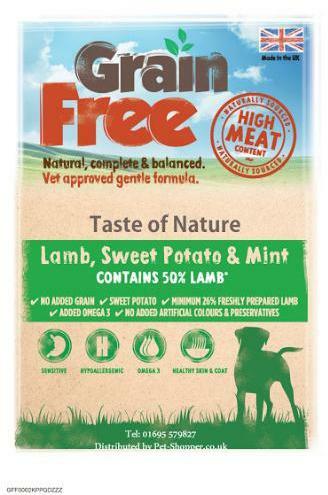 50% Lamb – Designed to closely mimic your pets’ ancestral diet. Freshly Prepared Lamb Meat– A natural, traditionally sourced and highly digestible protein source. Vitamins; Vitamin A (as retinyl acetate) 14,423 IU/kg, Vitamin D3 (as cholecalciferol) 2,163 IU/kg, Vitamin E (as alpha tocopherol acetate) 144 mg/kg. Trace Elements: Zinc Sulphate Monohydrate 134 mg/kg, Ferrous Sulphate Monohydrate 160 mg/kg, Manganous Sulphate Monohydrate 105 mg/kg, Cupric Sulphate Pentahydrate 58 mg/kg, Calcium Iodate Anhydrous 1.58 mg/kg, Sodium Selenite 0.64 mg/kg.